Mercy’s Founder and President, Nancy Alcorn, with her beloved Jude. 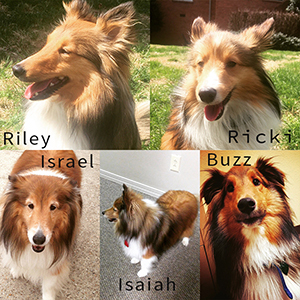 It’s been said that “a dog is man’s best friend.” But at Mercy, it’s not just any dog – it’s a Sheltie. And it’s not just any “man” – it’s a Mercy dog mom! 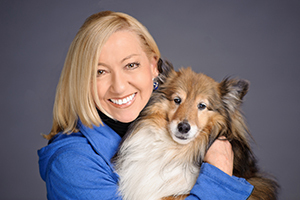 Mercy Multiplied’s Founder and President Nancy Alcorn first introduced the dog mom concept to the Mercy residents through an overflow of her love for Shelties – in particular, one beloved Sheltie named Jude. Alcorn’s puppy Jude was born December 1998 and quickly became a regular visitor at the Nashville Mercy home, attending programs at the home with Alcorn and staying with the residents while Alcorn traveled for numerous speaking engagements. 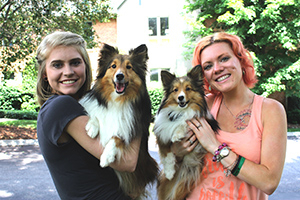 Alcorn introducing puppies Ricki and Riley to the Nashville residents. Generally speaking, a Mercy resident becomes a “dog aunt” before ever being considered for a “dog mom” role. A resident can request to be a dog aunt after she has been in the program for at least 30 days. This gives a young women time to adjust to her new schedule, establish relationships with the other girls in the home, and settle into her counseling. Once Mercy staff observe that a resident is adjusted to the Mercy program, she is approved to assist dog moms as necessary. This can include various activities like washing and brushing the dogs or taking the dogs outside if the dog mom is in school or on dinner detail. 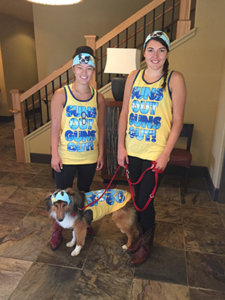 Mercy dog moms Susie (l.) and Annie (r.) with Oates, ready for the Sacramento sun! Once a resident reaches her 90-day evaluation, she can be considered for an available dog mom role. These transitions occur if a current dog mom is graduating from Mercy or needs to focus on other parts of the Mercy program and has asked to be relieved of her duties. Once a resident is a dog mom, she typically serves in this role for three or more months. During that time, she is responsible for all things that any dog owner would be: feeding, training, exercise, play time, and kenneling the dog in her room at night. 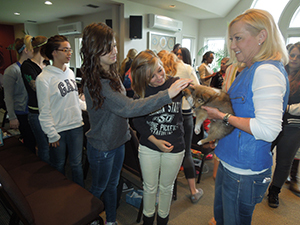 For more information on Mercy’s residential program, click here.